R Maria Peralta has no relevant conflicts of interest to declare. Kevin J Blinder is a consultant and speaker for Regeneron Pharmaceuticals, Allergan and Bausch & Lomb. Early detection and intervention in DMO is key to reducing the risk of permanent vision loss. Therefore, understanding the pathophysiology of DMO is vital to progression in treating DMO. DMO causative factors include both inflammatory and ischaemic mechanisms. DMO is associated with hyperglycaemia as well as oxidative stress; endothelial and pericyte cells along with the associated tight junctions in the blood-retinal barriers degrade, causing blockage of capillary perfusion to retinal and neural cells. The body’s response is the release of cytokines, chemokines and other mediators such as VEFG. VEFG also increases leukocyte adhesion to capillaries, which contributes to endothelial and neuronal apoptosis. Other inflammatory mediators implicated in diabetic retinopathy and DMO development are chemokines like C-C motif chemokine ligand 2 (CCL2), integrins transmembrane receptors, insulin-like growth factor (IGF-1), platelet-derived growth factor, and basic fibroblast growth factor. One of the first lines of defence when treating DMO has always been to reduce systemic risk factors, such as elevated blood glucose levels, lipids, and blood pressure. DRCR.net has concluded that “results suggest that optimising glycaemic control remains a substantive challenge requiring more extensive interventional paradigms.”8 Other treatments include focal and scatter laser treatment, vitrectomy, corticosteroids, and finally anti-VEFG therapy. The history of these treatments, as well as how prevailing they are, have much to do with the short- and long-term side effects and outcomes in vision. The introduction and rapid adoption of intravitreal pharmacologic agents, particularly drugs that block VEGF and corticosteroids, have changed the goal of diabetic retinopathy treatment from stabilisation to improvement of vision. Corticosteroids are (steroids) received via intravitreal injections, or by sustained released implant. They can improve vision by interfering with the inflammation and ischaemic mechanisms that damage the retinal-blood barrier and may also inhibit neovascularisation.11,12 However, steroid therapy is known for causing complications such as cataracts, elevated intraocular pressure (IOP; a major risk factor of glaucoma) and endophthalmitis.13,14 Long-lasting sustained-release corticosteroids (e.g., Iluvien® fluocinolone acetonide [Alimera Sciences, Inc., GA, US] and Ozurdex® dexamethasone [Allergan, Dublin, Republic of Ireland]) allows providers to treat with minimal intervention, and allows for more control since patient visits can be spread out over time. With recurrent injections, follow-ups are crucial to the treatment of DMO. Protocols I and T used monthly injections for 4 months or until OCT was dry before switching to monthly pro re nata (PRN) protocols based on strict retreatment criteria. PRN treatment regimens reduce the number of injections, but not the number of office visits. The RETAIN trial compared treat and extend (T&E) + laser, T&E and PRN ranibizumab regimens over 24 months in patients with DMO.30 Patients in all groups were treated monthly until dry. 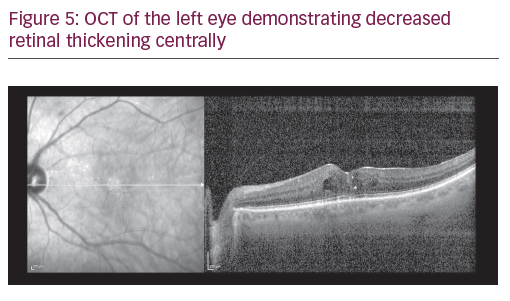 Visual acuity improvement in all groups was similar (T&E + laser, +5.9 letters; T&E, +6.1 letters; PRN ranibizumab, +6.2 letters), and the mean number of injections were 12.4, 12.8 and 10.7, respectively, but patients treated with T&E required 46% fewer office visits. Over 70% of patients had treatment intervals extended to at least 2 months. These results are encouraging and although a multi-centre, randomised trial comparing monthly therapy with T&E would be useful, this will not deter physicians from employing a T&E approach when treating DMO. DMO is a complex disease, and with the introduction of potent therapeutic agents we have seen dramatic results over the past decade. Although anti-VEGF therapies continue to evolve, the future holds tremendous promise for new novel therapies. Careful patient selection is key to optimising treatment outcomes as new pharmacologic drugs are added to our treatment armamentarium. A 75-year-old Caucasian female presented for ongoing treatment of DMO. After recent treatments with intravitreal bevacizumab, visual acuity was 20/400 OD and 20/200 OS. 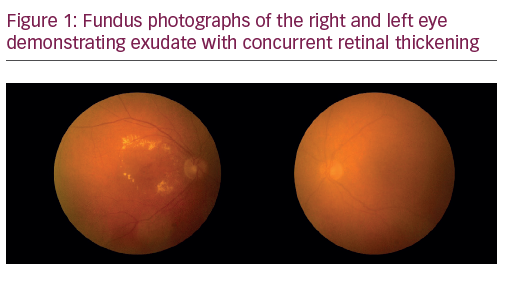 Funduscopic examination revealed non-proliferative diabetic retinopathy with DMO OU (Figure 1). OCT revealed persistent thickening OU (Figures 2 and 3). Aflibercept 2 mg was injected intravitreally OU. Upon follow-up, 2 months later, visual acuity had improved to 20/60-2 OD and 20/70+1 OS. Funduscopic examination revealed reduced thickening, with the OCT confirming the clinical findings (Figures 4 and 5). The patient received a repeat intravitreally injection of aflibercept to the left eye, with observation of the right eye. Diabetic Retinopathy Clinical Research Network. Bressler SB, Almukktar T, Bhorade A, et al., Protocol I laser-ranibizumab triamcinolone for DME, JAMA Ophthalmol, 2016;134:378–85. Lee R, Wong TY, Sabanyagan C, Epidemiology of diabetic retinopathy, diabetic macular edema and related vison loss, Eye Vis (Lond), 2015;2:17. Zhang X, Zeng H, Bao S, et al., Diabetic macular edema: new concepts in patho-physiology and treatment, Cell Biosci, 2014;4–27. Diabetes Control and Complications Trial Research Group, Progression of retinopathy with intensive versus conventional treatment in the Diabetes Control and Complications Trial, Ophthalmology, 1995;102:647–61. Thomas RK, In Sickness and in Health: Disease and Disability in Contemporary America, New York: Springer, 2015, 187. Panozzo G, Parolini B, Gusson E, et al., Diabetic macular edema: an OCT-based classification, Semin Ophthalmol, 2004;1–2:13–20. 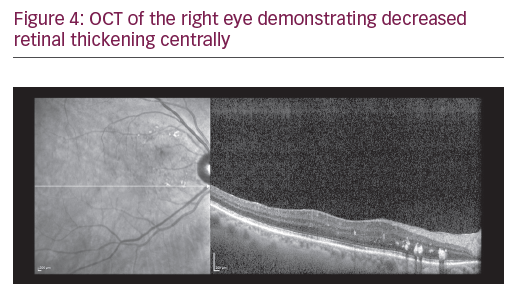 Diabetic Retinopathy Clinical Research Network, Browning DJ, Glassman AR, Aiello LP, et al., The relationship between optical coherence tomography-measured central retinal thickness and visual acuity in diabetic macular edema, Ophthalmology, 2007;114:525–36. Diabetic Retinopathy Clinical Research Network, Aiello LP, Ayala AR, Antoszyk AN, et al., Cluster randomized trial assessing the effect on diabetes control of personalized diabetes complication risk assessment during ophthalmology exams, JAMA Ophthalmol, 2015;133:888–896. Photocoagulation therapy for diabetic eye disease. Early Treatment Diabetic Retinopathy Study Research Group, JAMA, 1985;254:3086. 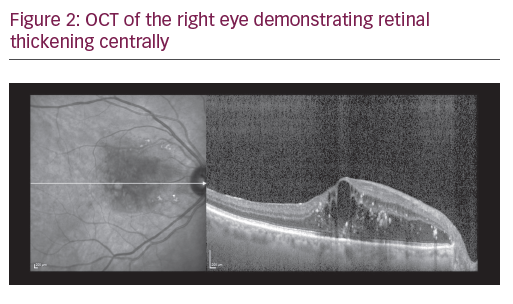 Bressler NM, Wenick SA, Diabetic macular edema: current emerging therapies, Middle East Afr J Ophthalmol, 2012;19:4–12. Brooks HL Jr, Caballero S Jr, Newell CK, et al., Vitreous levels of vascular endothelial growth factor and stromal derived factor 1 in patients with diabetic retinopathy and cystoid macular edema before and after intraocular injection of triamcinolone, Arch Ophthalmol, 2004;122:1801–7. Kompella UB, Bandi N, Ayalasomayajula SP, Subconjunctival nano- and microparticles sustain retinal delivery of budesonide, a corticosteroid capable of inhibiting VEGF expression, Invest Ophthalmol Vis Sci, 2003;44:1192–201. Diabetic Retinopathy Clinical Research Network. A randomized trial comparing intravitreal triamcinolone acetonide and focal/grid photocoagulation for diabetic macular edema, Ophthalmology, 2008;115:1447–9. Sutter FK, Simpson JM, Gillies MC, Intravitreal triamcinolone for diabetic macular edema that persists after laser treatment: three-month efficacy and safety results of a prospective, randomized, double-masked, placebo-controlled clinical trial, Ophthalmology, 2004;111:2044–9. Boyer DS, Yoon YH, Belfort R Jr, et al., Three-year, randomized, sham-controlled trial of dexamethasone intravitreal implant in patients with diabetic macular edema, Ophthalmology, 2014;121:1904–14. Fraser-Bel S, Lim LL, Campain A, et al., Bevacizumab or dexamethasone implants for DME: 2-year results (The BEVORDEX Study), Ophthalmology, 2016;123:1399–401. Cunha-Vaz J, Ashton P, Lezzi R, et al., Sustained delivery fluocinolone acetonide vitreous inserts provide benefit for at least 3 years in patients with diabetic macular edema, Ophthalmology, 2012;110: 2125–32. 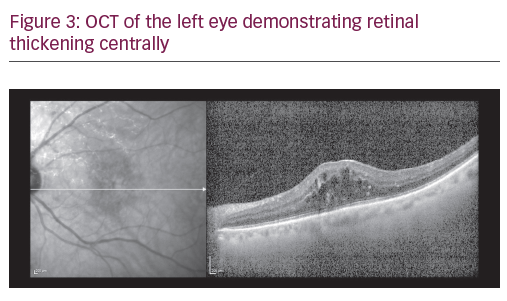 Quam T, Xu Q, Joussen AM, et al., VEGF-initiated blood retinal barrier breakdown in early diabetes, Invest Ophthalmol Vis Sci, 2001;42:2408–13. Do DV, Schmidt-Erfurth U, Gonzalez VH, et al., The DA VINCI Study: phase 2 primary results of VEFG Trap-Eye in patients with diabetic macular edema, Br J Ophthalmol, 2009;93:144–49. Diabetic Retinopathy Clinical Research Network, Elman MJ, Aiello LP, Beck RW, et al., Randomized trial evaluating ranibizumab plus prompt or deferred laser or triamcinolone plus prompt laser for diabetic macular edema, Ophthalmology, 2010;227:1064–77. Diabetic Retinopathy Clinical Research Network, Wells JA, Glassman AR, Ayala AR, et al., Aflibercept, bevacizumab, or ranibizumab for diabetic macular edema, N Engl J Med, 2015;372:1193–203. Brown DM, Nguyen QD, Marcus DM, et al., Long-term outcomes of ranibizumab therapy for diabetic macular edema: the 36-month results from two phase III trials: RISE and RIDE, Ophthalmology, 2013;120:2013–22. Korobelnik JJ, Do DV, Schmidt-Erfurth U, et al., Intravitreal aflibercept for diabetic macular edema, Ophthalmology, 2014;121:2247–54. Boyer DS, Nguyen QD, Brown DM, et al., Long-Term outcomes of the phase III RIDE and RISE trials, Ophthalmology, 2015;122:2504–13. Michaelides M, Kaines A, Hamilton RD, et al., A prospective randomized trial of intravitreal bevacizumab or laser therapy in the management of diabetic macular edema (BOLT study) 12-month data: report, Ophthalmology, 2010;117:1078–86. Diabetic Retinopathy Clinical Research Network, Bressler SB, Almukhtar T, Aiello LP, et al., Green or yellow laser treatment for diabetic macular edema: exploratory assessment within the Diiabetic Retinopathy Clinical Research Network, Retina, 2013;33:2080–8. Diabetic Retinopathy Clinical Research Network, Bressler SB, Ayala AR, Bressler NM, et al., Persistent macular thickening after ranibizumab treatment for diabetic macular edema with vision impairment, JAMA Ophthalmol, 2016;134:278–85. Dhoot DS, Pieramici DJ, Nasir M, et al., Residual edema evaluation with ranibizumab 0.5 mg and 2.0 mg formulations for diabetic macular edema (REEF Study), Eye, 2015;29:534–41. Diabetic Retinopathy Clinical Research Network, Wells JA, Glassman AR, Ayala AR, et al., Aflibercept, bevacizumab, or ranibizumab for diabetic macular edema: Two-year results from a comparative effectiveness randomized clinical trial, Ophthalmology, 2016;123:1351–9. Prunte C, Fajnkuchen F, Mahmood S, et al., Ranibizumab 0.5 mg treat-and-extend regimen for diabetic macular edema: the RETAIN Study, Br J Ophthalmol, 2016;100:787–95.